The Babyletto Hudson 3-in-1 Convertible Crib is one of the most popular cribs out of the 10 baby cribs that I am reviewing. It is popular for several very good reasons. This crib has a mid-century and modern appeal to it. It is a 3-in-1 convertible crib, so you will get to use this for all of the stages from infant to toddler to young child. This crib has stylish rounded spindles that give it a simple charm. The all-spindle sides make it possible to see your baby from all directions and angles. It has four adjustable mattress positions that allow you to maximize your baby's comfort while not compromising anything on safety. The Babyletto Hudson 3-in-1 Convertible Crib is overwhelmingly liked by parents who bought and used it with their babies. Parents like how easy it is to set up, and how it converts so nicely into a toddler bed and then a daybed. I've listed the top comment topics here and condensed the parent reviews to make your search for a baby crib a bit easier. The nice thing about this crib is that it converts into 3 different positions. While the initial price might be more than what you could buy a standard crib for, remember that you will not have to then buy a toddler bed, or a daybed. So, in the long run, the Babyletto Hudson 3-in-1 Convertible Crib should save you money. This crib will just keep on going and changing as your baby grows. When your infant is ready for a toddler bed, simply make the easy conversion. The toddler conversion kit is included in your initial purchase. Then later, it can transform again, but this time into a daybed. The Babyletto Hudson 3-in-1 Convertible Crib is made from New Zealand pine wood. You can choose between a modern grey crib, clean white, or a white/expresso two tone. The dimensions of the crib are 52 inches long by 27 1/2 inches wide. The mattress will be about 6 inches thick. A mattress is not included in the price of the crib, though you can buy a Babyletto mattress that will fit snugly in this crib. For safety reasons, it's very important that you buy a mattress that does not have a gap between the sides. 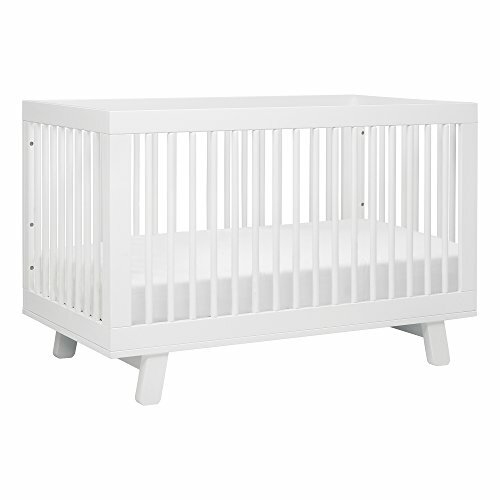 I read a lot of the parent reviews and each one said that this crib was very quick and easy to set up. Most said it took only around 10 minutes to set up. However, most parents also said that it was best to have two people put it together. So grab your spouse, friend, family member or next door neighbor, for about 10 minutes and you should be in business. One of the great features of this crib is that if you are shorter, lifting your baby out of this crib should not be a problem. The rails are only about 36 inches from the floor. So, you shouldn't have much of a problem setting your baby down and lifting your baby up again if you are a shorter parent. Even though the rails are only 36 inches off of the floor, they are still standard sized rails. The whole crib just happens to sit closer to the floor. This means you won't have to worry if you have a taller toddler. Parents liked the clean look of this crib. It seems to go well with any kind of decor. Some of the words that parents used to describe the crib kept being used over and over. Some of those descriptive words were: beautiful, elegant, nice color, and modern. Although this is a great crib for parents who are short, some did complain that they wished the crib legs were taller. Some parents had wished that they could store things under the crib and also use a crib skirt. So, you may want to think about if you like a crib closer to the ground, or if having a crib skirt and storage room is more important to you. If there is one thing that you will want a crib to have, that should be durability. This crib scores very high by parents in the durability category. Words that kept surfacing over and over again on parent reviews were, "very well built" and "very sturdy." I highly recommend this crib. Parents who bought it rated it very high. I like the fact that when your baby has grown into a toddler, you can simply convert the crib into a toddler bed. The conversion kit is included in your crib purchase. Then, when your toddler outgrows his or her toddler bed, you can convert it into a daybed. Though the initial price is a bit higher than most standard cribs, in the long run this crib should save you money. This crib is also very durable and sets up easily with two people helping in about 10 minutes. For the person that doesn't want to follow directions all weekend, this may be the crib for you. It is great for shorter parents. The taller parents that commented said the short legs were not a problem. Remember this will convert to a toddler bed and then a day bed, so hence the short legs. So overall I give this crib two thumbs up. I hope that you have enjoyed my review of the Babyletto Hudson 3-in-1 Convertible Crib. To see the rest of our baby crib reviews, check out our Top Ten Baby Cribs of 2018 article.